"I'm s-s-s-s-oree-ee da-d-dee," he said with tears streaming down his chin, snot swiped across his cheek, and in the most adorable whimper that nearly broke my heart. We're trying to teach our very young son about right, wrong, consequences and rewards. It's not fun. Except for the rewards part. Which, right now is picking him up out of the pack-n-play where he's served his time-out, cuddling him and soothing his misery and reexplaining to him just what he did that was wrong and that even when he's bad, Mommy and Daddy still love him no matter what, but that being bad upsets us and the result is a time-out (or a swift smack on the hand if he did something dangerous). Tonight's bad choice: spilling salt from a salt shaker all over the floor that we had just vacuumed. I don't think he really knew it was such a big deal but he knows now. Teaching a child at this age to apologize is not easy. He's probably much too young to even comprehend the concept of feeling remorse, but I think it's important to introduce this to him early on. Too many children today, it seems, get to skip this part, but I won't have it. As much as I dislike this part of the parenting experience, my favorite part is loving him and reassuring him that I love him no matter what. I love to snuggle him and console him. 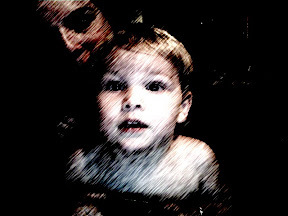 I love the part where he hugs me and says "I love you, Mommy," and then goes back to playing without holding a grudge. Our son is blossoming and absorbing so much right now. I'm so very proud of him each and every day. Awwww! Isn't that the hardest part of being a mommy? You're supposed to make everything good and happy, not inflict misery. You're right about other kids today getting to skip remorse, I think parents tend to forget they're raising future adults.